The Planning Period for Flexible Savings Accounts (FSA) has closed, and one’s hard-earned money may go to waste if not used within the allotted grace period (through March 15, 2019). However, despite the constant reminders to maximize one’s FSA funds, employees enrolled in the program are still unaware of when and where they should purchase FSA-approved items, such as first aid kits. Surviveware, a leading camping, and preparedness company offer several FSA-eligible products. One of the eligible products offered by Surviveware is their First Aid Kits. Surviveware offers two types of first aid kits that meet the needs and requirements of any individual. The kits have gone through a series of tests to ensure that they can serve their purpose and withstand rugged conditions. These kits have been recommended by campers, survivalists, hikers, EMTs, and medical professionals. For hikers, adventure enthusiasts, hunters, and travel buffs, Surviveware recommends their Small First Aid Kit. This 8” x 6” x 3” first aid pack contains 100 life-saving essentials that fit the dynamic and ever-changing demands of individuals with active lifestyles. Despite its size, this kit contains several types of bandages, adhesive strips, cleansing wipes, eye pads, and steri-strips. The pack can also hold additional supplies such as an emergency blanket, nitrile gloves, hypoallergenic tapes, sting relief wipes, and even a CPR kit. Since the kit has compartments that hold and organize the provisions, ample space is made available for additional supplies such as prescription medications, an epi-pen, or a multipurpose tool. Weight is one of the primary considerations when it comes to hiking and traveling. Therefore, the first aid kit intended for this purpose should be lightweight and small. Surviveware’s Small First Aid Kit only weighs one pound and can be strapped on one’s backpack or hiking gear. Surviveware offers their Large First Aid Kit for home, vehicle, and business owners who wanted to provide maximum protection and assurance to their families and employees. This revolutionary product offers the same quality and coverage as the Small First Aid Kit but on a different level. The pack provides a wider array of supplies for the diverse and varying needs of homes, vehicles, and business establishments. While the small first aid kit contains 100 supplies, this expanded version holds twice the number of medical items,t as well as the inclusion of other specialized items. The large first aid kit also contains cold packs, fever strips, hydrogels, a pencil, pressure bandages, splinter probes, and wound dressings, and more. The large first aid kit also includes a mini kit that holds 50 pieces of provisions. This mini pack can be strapped on the belt, rucksack, or a service dog vest for quick trips that require light packing. Since the mini kit is filled with its provisions, owners don’t need to replenish its contents with the supplies from the large first aid kit. 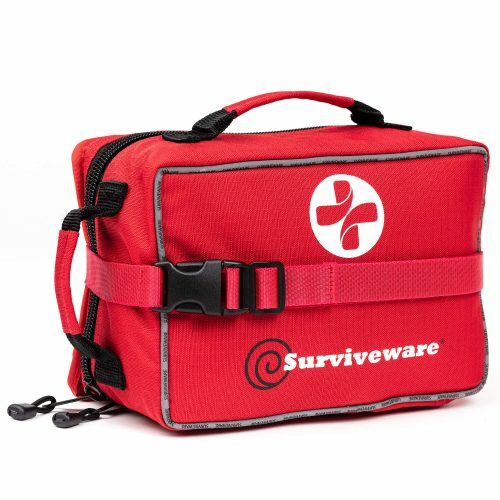 The Surviveware’s First Aid Kit cases are made from 600D Polyester fabric. The company chose this material due to its water-resistant and durable features. Since these kits may be exposed to extreme travel and weather conditions, it is important that the material used for its casing is lightweight and can withstand water, dirt, and frost. Moreover, the polyester fabric is malleable and durable. Hence, it will not tear or break easily like plastic-cased first aids. Make the most out of your remaining FSA funds and grab Surviveware’s Small First Aid Kit and Large First Aid Kit. Keep your family secure and protected while out on a grand adventure. Purchase them today and enjoy 20% off each first aid kit by using Surviveware’s Amazon discount coupons. Get them while stocks last! Grab your Small First Aid Kit by clicking here. Interested in the Large First Aid Kit? Order one here.